Invertebrate, Microbial Ecology, Soil Ecology, Bacterial symbionts of Invertebrate, Exploring The Niches of Microbial and Invertebrate in Soils. 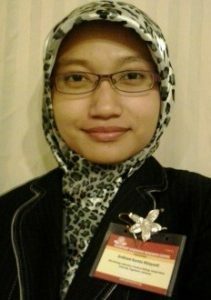 Hidayanti,A.K., A.N. Lathifah, W.A. Ramadhaningrum, A. Ridhowati, F.B. Muhammad, Nindyasari,R.E., M.D. Setyorini, A.A.C. Permana, Trijoko and Y.A. Purwestri. 2011. Isolation Bacteria and Characterization Cellulose Enzym from Milkfish (Chanos chanos). Proceedings International Conference on Sustainable Agriculture and Food Security, Unpad, Bandung. Nindyasari,R.E.,Hidayanti,A.K., A. Ridhowati, D. Setyorini,F.B. Muhammad, A.A.C. Permana and Y.A. Purwestri. 2011. Enzyme Charactrization of Cellolytic Bacteria as Potential Agent to Degrade Organic Waste. Proceedings International Conference on Biological Science, UGM, Yogyakarta. Hidayanti,A.K., A.N. Lathifah, W.A. Ramadhaningrum, A. Ridhowati, F.B. Muhammad, N.D. Maharani, A.U. Hasanah, Trijoko, dan E.Sutariningsih. 2011. Gastrointestinal Bacteria diversity of milkfish (Chanos Chanos) as a potential candidate Probiotics .Proceedings Congress And Conference Of Indonesia Marine Taxonomy Society. 20-22 September 2011. LIPI Jakarta. p 5.